It’s time for a new sketch at Freshly Made Sketches. I totally love this sketch that my super-talented friend Karren has designed. So easy to work with – I had my card made in no-time. I was sitting in my craft for a total of two minutes with the thinlit “Happy” in my hand when an idea came to me. 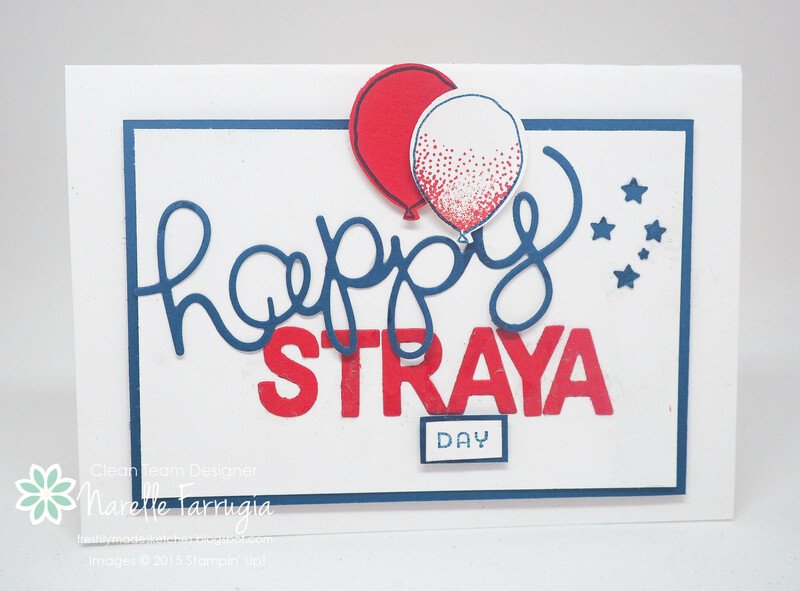 It occurred to me that as it was Australia Day, I would make a Happy Australia Day card. After a fews secs I realised there was no way Australia was going to fit on my card so I changed it to Straya instead. I am so not a fan of this slang word for Australia but I created it for a bit of fun. A friend of mine was the receiver of this card as I knew she would see the funny side of it. I’ve added a Southern Cross and some balloons on there to finish off my card. 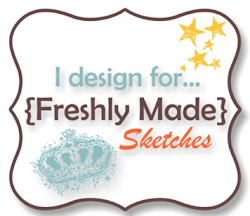 Come and join us with this great sketch challenge at Freshly made Sketches. Head over to the blog and take a look at the inspiration the Design Team have provided for you. Bright and fun! And educational……I learned a few things because of this card! Lol! Made me smile….. This is such a fun card and gave me a laugh! I hope you DID have a Happy Straya Day! Wonderful fun and bold sentiment for this sketch! LOVE the balloons and star accents! Well, I learned something new today! Happy [belated] AUSTRALIA Day! LOL Hope you had a ‘Happy Straya’ Day Narelle! Love the stars – they remind me of the Aussie flag! How fun! I had never heard that term before, but I totally get it now when I say it in my head with an Australian accent. Hope you enjoyed your holiday! Great card Narelle! I can totally picture someone saying this now that you’ve told us a bit about it!!!! Love the colours and those sweet little stars! Bright, cheery and fun card Narelle! Fabulous! Fun card ,love the balloons!!! I totally missed that you had added the Southern Cross…..how brilliant you are. Fabulous card! !